Sunday, the China Manned Space Engineering Office confirmed the Tiangong-1 space laboratory fell out of orbit, with much of the 10.4-meter structure burning up in Earth's atmosphere before the remainder crashed into the Pacific Ocean at 8:15 a.m. Beijing time (12:15 a.m. UTC). "Through monitoring and analysis by Beijing Aerospace Control Center and related agencies," reads a statement from the China Manned Space Engineering Office, "Tiangong-1 re-entered the atmosphere at about 8.15am, 2 April, Beijing time (0115 GMT). The re-entry falling area is located in the central region of the south Pacific." The United States Joint Force Space Component Command and partners from eight other countries confirmed the crash. Tiangong 1, which means "Heavenly Palace 1," was China's first space station. It was launched in 2011 as a stepping stone toward the development of a permanent space station but itself had an expected life of about two years. Authorities recalled the last astronauts in 2013 but continued to use the space station for other purposes until losing navigational control in 2016. Late last year, the Chinese informed the United Nations that they expected the space station would crash sometime in March 2018. Australian National University astrophysicist Brad Tucker described the station as "tumbling and spinning" for a long time before today's re-entry, which rendered its movements less predictable. The European Space Agency nonetheless described the chance of a person being struck by a piece of Tiangong-1 as extremely less likely than being struck by lightning. 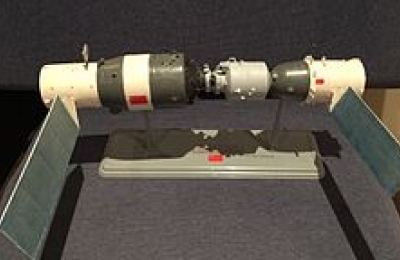 Model of the Tiangong Space Lab and Shenzhou manned spacecraft.Image: User:Leebrandoncremer. According to U.S. astronaut Leroy Chiao, the original plan had been for China to bring the space station down in a controlled fashion as the Russians did with the Mir space station in 2001. In 1979, the U.S. Skylab space station had an uncontrolled re-entry that scattered small pieces of debris across western Australia. No one was harmed, but the agency was issued a $400 fine for littering. Several memorials to the space station appeared in China's media. Public comments on the Weibo blog ranged from critical ("Re-entry? Everyone knows it's a crash") to poignant ("Goodbye Tiangong-1. You are our hero") and other tributes. One Chinese newspaper, the Global Times criticized the portrayal of Tiangong-1's end in Western media: "It's normal for spacecraft to re-enter the atmosphere, yet Tiangong-1 received so much attention partly because some western countries are trying to hype and sling mud at China's fast-growing aerospace industry." According to reports, the second Chinese space station, Tiangong-2, remains in orbit. China plans to launch a permanent space station by 2022, whereas the United States is currently debating a plan to withdraw support for the International Space Station as of 2024.